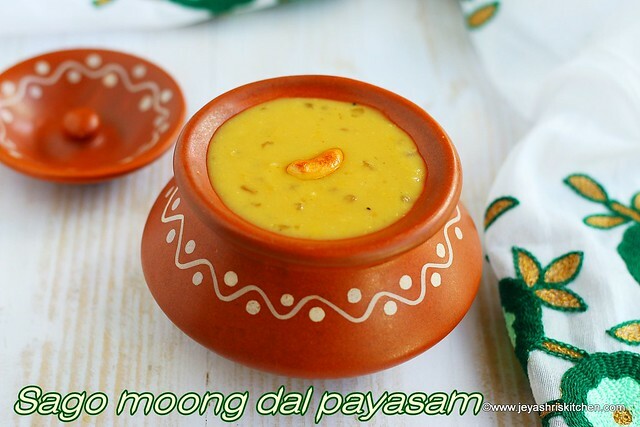 Sago moong dal payasam | Javarisi pasi paruppu payasam with jaggery and coconut milk. Recently during Ganesha Chaturthi we visited one of our friend's house for Ganesh Dharshan. 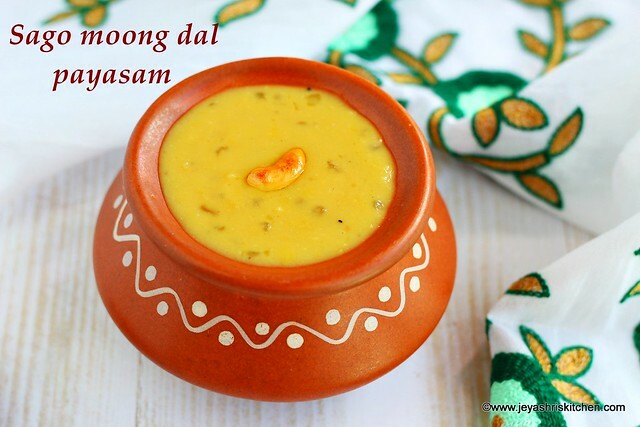 Her mom made this yummy sago moong dal payasam. The flavour of coconut milk and moong dal combo was truly awesome and the bites of sago pearls in between was a treat to the taste buds. I asked her for the recipe and she messaged me few days back. I always want to javarisi payasam with jaggery so i was waiting to try this out. As it is Navaratri season, i wanted to post this sago payasam recipe. Try this out and i am sure you will love this. Check out my full collection of navratri recipes. Soak moong dal and sago separately for an hour. After an hour, in a heavy bottomed pan add the soaked moong dal and start cooking it. When the moong dal is 3/4 th cooked, wash the sago and add it to the pan. Add little more water and start cooking till the sago gets coked completely. Ensure that it should not gets burnt in the bottom of the pan. Add thin coconut milk to this now. Add the jaggery to this now. If you feel the jaggery has dust, melt this separately in little water and add to this. Once the jaggery melts and gets blended with the cooked sago and moong dal, switch off the flame. Add the thick coconut milk to this and mix well. Fry the cashew nuts and raisins in ghee and add to the payasam. Serve the payasam hot or chilled. Add little more water and start cooking till the sago gets cooked completely. The payasam gets thickened as it cools down, so ensure to add enough water while cooking. In the original recipe my friend told to add more moong dal and less sago. But since we all love sago pearls i added equally. If you want to add milk to the payasam, add 1/2 cup once the payasam in completely cool. I used the gula melaka available in fairprice shops instead of jaggery. For my readers in Singapore you can try this out. Made it today for prasadam, superb. Thank you Jeyashri.